Ryutaro Asada is enjoying his peaceful life in the countryside, when he is visited by Akira Kato, assistant professor of the Faculty of Cardiac Surgery at Meishin University Medical Hospital. 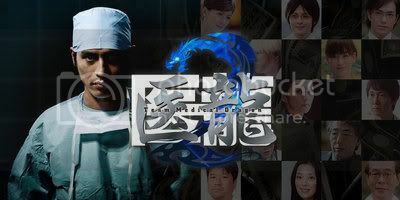 Ryutaro is a genius surgeon who used to lead "Team Medical Dragon," a world-class NGO medical team. In harsh environments that lacked medicine and electricity, Ryutaro witnessed many lives pass away. At the same time, he saved many other lives, helping his matchless skill overwhelm other doctors. This dorama is a real classic. I was addicted to it just after 10 minutes into the dorama. It gives you this nice feeling when you're watching because the timing of the soundtracks are superb. The best OST I've heard since H2. The acting is reasonably well, especially Natsuki Mari. Give it a try. I bet you'll get hooked to it in no time. I watched it on a sick day cuz' I heard it was good. And I like American doctor dramas, so I thought I would a Japanese one a chance. Not as good as "HOUSE" but still good. I'm waiting for uploads of season 2.